Aquaman #13 doesn't feel like much of a conclusion to The Others storyline, with a resolution that solves little of the core conflict of the storyline. This issue suffers from the main problem that has plagued this entire story arc. 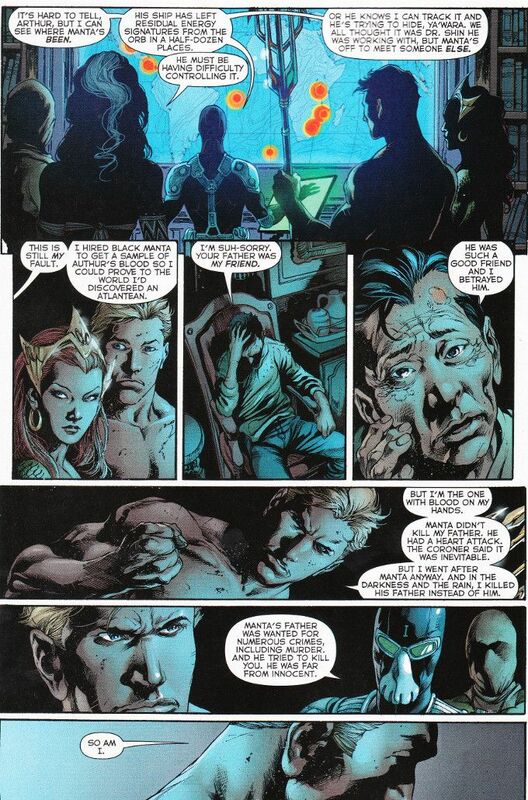 The stories that Geoff Johns eludes to having occurred in Aquaman's past and his previous partnership with a team of outcasts empowered by Atlantean artifacts before joining the Justice League are far more interesting than the story he is telling where that team is killed off, one at a time, by Black Manta as part of his latest revenge scheme. Despite this, Johns' greatest strength as a writer - a playwright's gift for character and dialogue - saves this book and this series. Johns' introduces the great concept that for Arthur Curry, being Aquaman was an escape from the man he thought he was becoming. Being a walking punchline and "the one who talks to fish" on the surface world was preferable to being the a killer who acted out of a vicious need for revenge and created his own worst enemy in doing so. The man vs. himself angle adds an entirely new perspective on Aquaman's personality - one far more complex than even Peter David ever explored. Ivan Reis' artwork is, as always, amazing and a perfect complement to Johns' scripts. The sketchiness from last issue is gone, presumably due to Reis' pencils only being worked on by a team of two inkers this time around. Whatever the case, the artwork this time looks more polished and the shadows less random. Aquaman continues to be one of the best books to come out of the New 52, with top-notch artwork by Ivan Reis and Geoff Johns' scripts exploring the hidden depths of the King of the Seven Seas. Highly recommended!